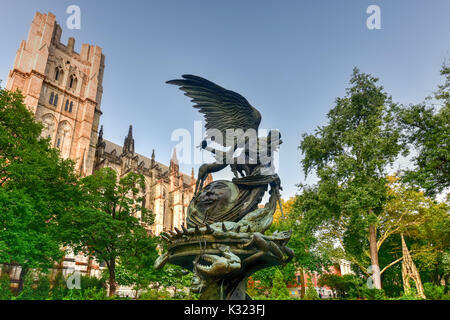 The Peace Fountain at Cathedral of St. John the Divine. 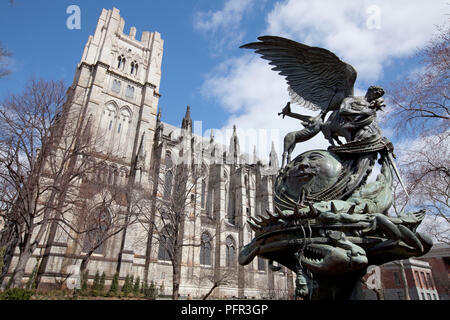 Designed by Greg Wyatt in 1985 depicting the struggle between good and evil, with Archangel Michael defeating Satan. 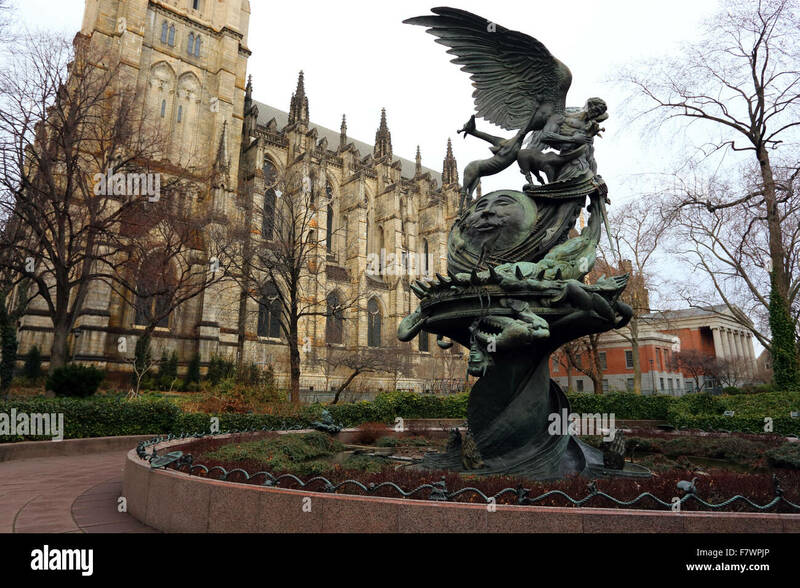 A plaque at the base of the sculpture reads: Peace Fountain celebrates the triumph of Good over Evil, and sets before us the world's opposing forces—violence and harmony, light and darkness, life and death—which God reconciles in his peace. 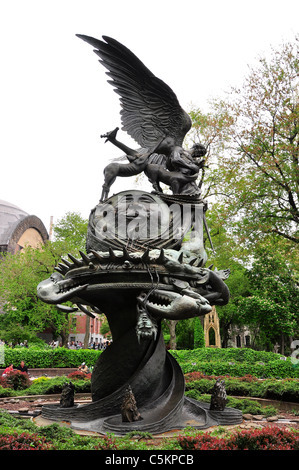 When the fountain operates, four courses of water cascade down the freedom pedestal into a maelstrom evoking the primordial chaos of Earth. Foursquare around the base, flames of freedom rise in witness to the future. 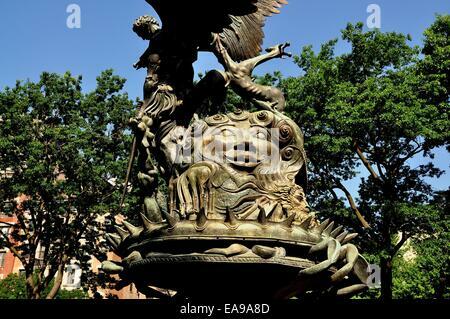 Ascending from the pool, the freedom pedestal is shaped like the double helix of DNA, the key molecule of life. 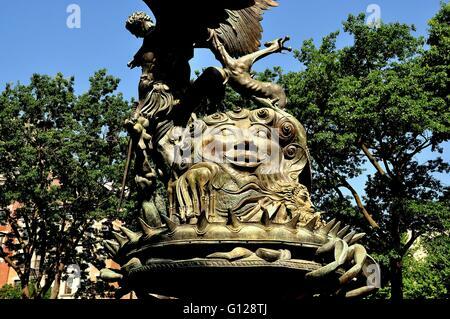 Atop the pedestal a giant crab reminds us of life's origins in sea and struggle. Facing West, a somnolent Moon reflects tranquility from a joyous Sun smiling to the East. The swirls encircling the heavenly bodies bespeak the larger movements of the cosmos with which earthly life is continuous. Nine giraffes—among the most peaceable of animals—nestle and prance about the center. 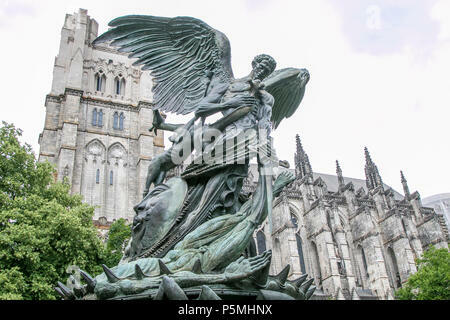 One rests its head on the bosom of the winged Archangel Michael, described in the bible as the leader of the heavenly host against the forces of Evil. 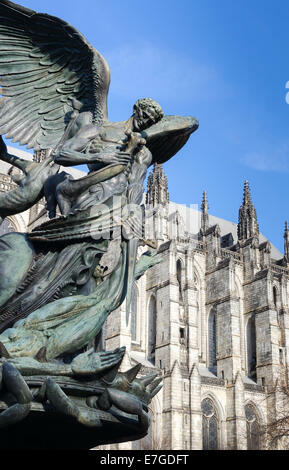 St. Michael's sword is vanquishing his chief opponent, Satan, whose decapitated figure plunges into the depths, his head dangling beneath the crab's claw. Tucked away next to the Sun, a lion and lamb relax together in the peace of God's kingdom, as foretold by the prophet Isaiah. 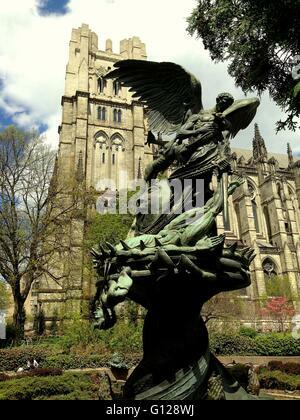 Peace Fountain by Greg Wyatt, installed in the garden by The Cathedral Church of St. John the Divine, that occupies the background. 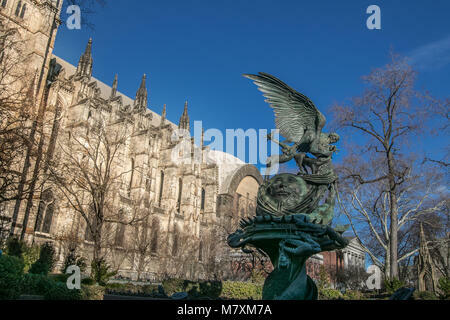 Peace Fountain by Greg Wyatt, by The Cathedral Church of St. John the Divine in NYC. 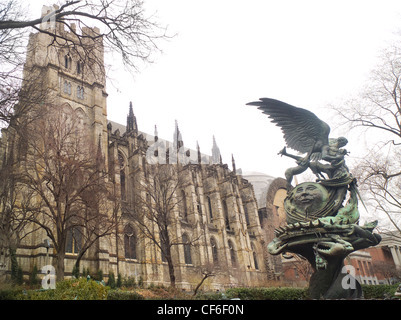 The Peace Fountain and the Cathedral of St. John the Divine. New York City. United States. 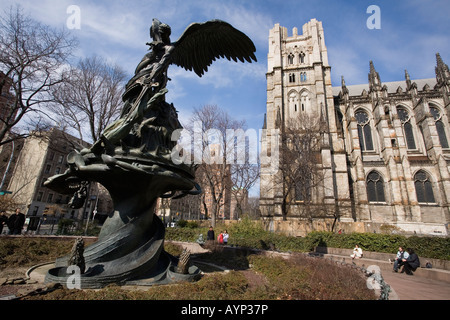 Peace Fountain located next to the Cathedral of Saint John the Divine in Morningside Heights in New York. 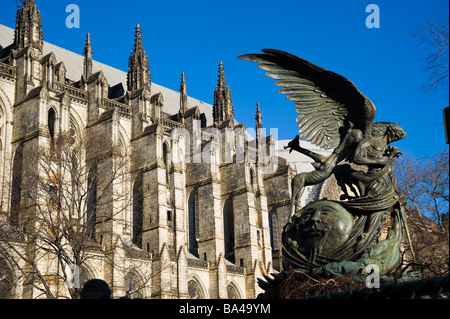 Peace Fountain Statue, and Cathedral of Saint John the Divine.